When it comes to listing the best plants for shade, hosta has to be at the top! 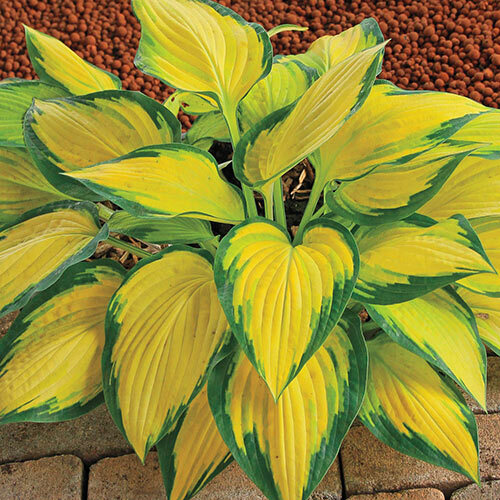 America's most popular perennial, the hardy hosta is known for its broad, textured foliage that comes in hundreds of colour combinations. Versatile and easygoing, hostas thrive in planting zones 3–9, require little care and fit in just about anywhere—including under a tree, in containers or along a wooded path. 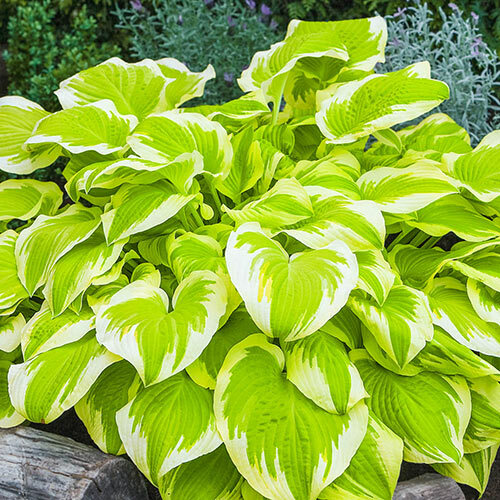 Their ample leaves are perfect for hiding withering bulb foliage in late spring, and their tall flower scapes in mid to late summer provide added dimension and colour. 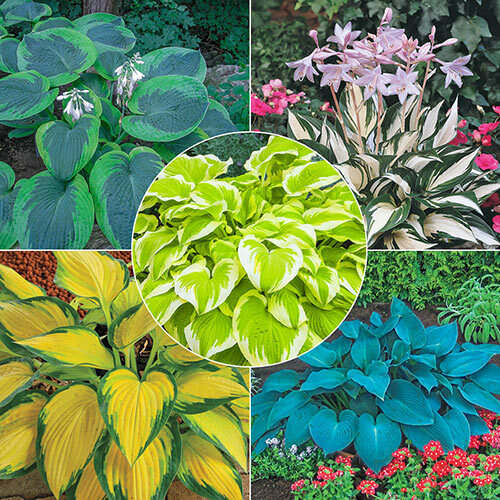 Our Exotic Colour Hosta Collection offers hosta lovers an exciting alternative to ordinary hosta hues— with bold colour combinations and incredible shapes and textures. Olive Bailey Langdon: Large, round leaves look like giant lily pads floating above the garden. This heavily corrugated, giant variety is rich blue-green with wide, chartreuse margins. Bell-shaped blooms are nearly white. 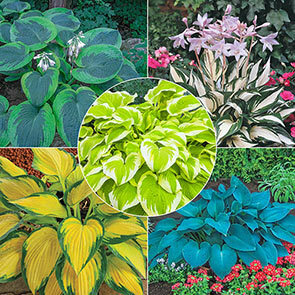 Foliage grows to 26–30" with 40" flower scapes. Fire and Ice: This hosta is both smokin' hot and ultra-cool! Irregular, flame-shaped, white centres divide mid to dark green leaves. Ideal for the front of a shady border or as ground cover. Produces scapes with pastel lavender, bell-shaped flowers. Compact foliage grows 10" tall with 30" flower scapes. Orange Marmalade: Quite a chameleon! Leaves emerge all green and then develop a bright orange-yellow centre. Later in the season, the leaf centres change again—this time fading to parchment white. Foliage grows to 17" with 26" flower scapes. Canadian Blue: Huge, heart-shaped leaves create a deep blue sea of foliage that's perfect for borders, containers or as ground cover beneath a tree. 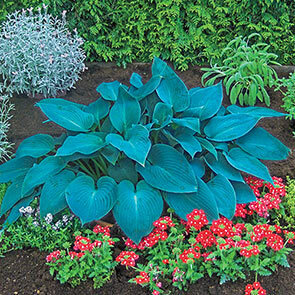 The thick, rippled leaves will stand up to damaging slugs. Pale lavender and white flower scapes appear in mid to late summer. Foliage grows 20" tall with 35" flower scapes. Delta Dawn: A rare find—Delta Dawn is a seldom offered variety with limited availability. 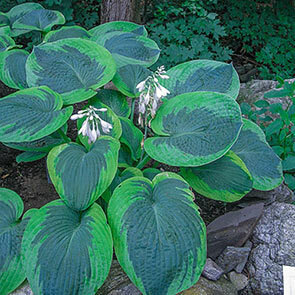 Its leaves are huge, with a unique light green-yellow hue, and irregular, bright ivory margins. As it matures, leaves turn chartreuse and become quilted. 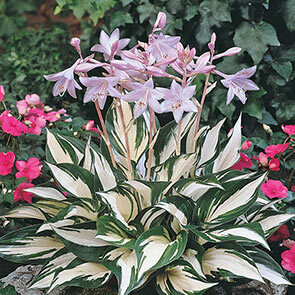 Foliage grows 16" tall with 32" flower scapes.